In large organizations and corporations, procurement is a domain that involves purchasing specialists that follow strict acquisition procedures and standards. Whenever a business owner is in need of certain goods or services, the procurement department will issue a purchase order (PO) either directly to accredited suppliers or to an intermediate operational purchasing entity. Specifically in situations whereby the actual operational ordering process is complex (e.g. many partial orders due to availability issues, various substitutes, multiple orderpoints) such an intermediate operational purchasing entity, whether internal or external, is beneficial. In order to support these complex purchasing scenarios, ReturnPool has developed a Purchase Order Management system that allows the operational entity to safeguard the imposed purchasing procedures and standards and create full visibility in the procurement process. 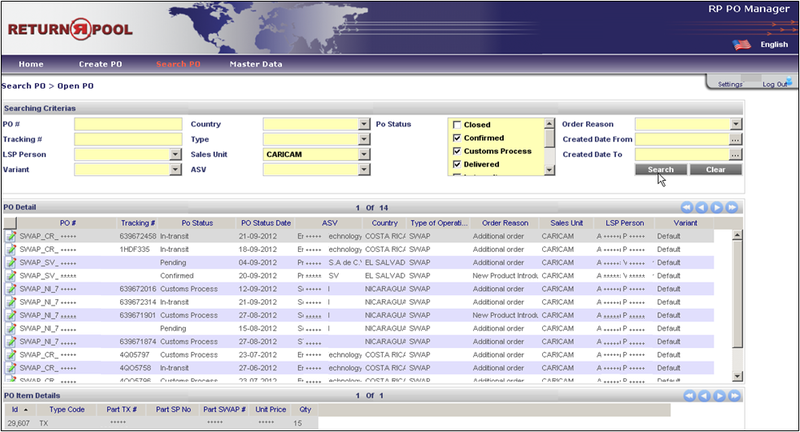 How does our Purchase Order Management system work? The ReturnPool Purchase Order Management system is developed to support intermediate operational purchasing entities in their day-to-day procurement process. Suppose a PO is issued by a planner on behalf a business owner to source a specific set of products. If needed, the operational buyers will “translate” this PO order into a subset of orders that can be issued to a variety of vendors and that, if required, consists of substitutes or alternative products. So, in this scenario two main parties are involved in the PO placement process; whilst the first party is in charge of requesting the PO, the second party is responsible for making sure orders get translated and submitted to the relevant suppliers. The Purchase Order Management system is aimed at creating visibility to both parties and at supporting the execution of the purchasing process. The platform is designed for users in multiple countries / organizations. The information is accessible through the cloud and accessible 24/7. The solution is available in a SAAS environment. If normally you are placing similar orders to your providers, the system offers the possibility to accelerate the process by using a previous PO as template for the new one. Reporting: All process steps and KPI’s can be reported upon using the ReturnPool Reporting Solution. Possibility to notify users via email once an order has been assigned by the planner to the relevant operational procurement responsible.